Results from an experiment run at the UK’s University of Nottingham prove that, compared with other fertilizers, Polysulphate multi nutrient sulphate fertilizer releases sulphur steadily for a longer period of time. Sulphur is an essential crop nutrient. Farmers have a choice of sulphate fertilizers to help crop growth. However, as with all soluble plant nutrients, there are concerns that sulphates are prone to leaching - or being lost through the soil beyond the root’s reach - before they can be taken up by the crop. 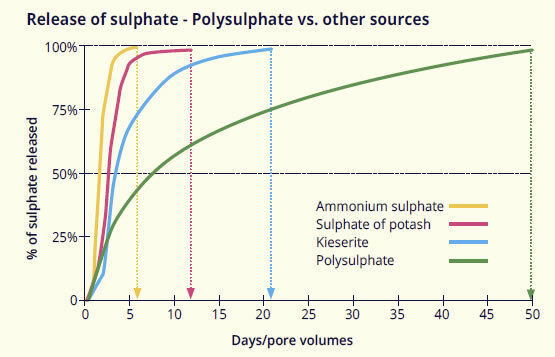 In the University of Nottingham soil column test experiment, the aim was to compare the rate of release of sulphate from Polysulphate compared with other fertilizers. 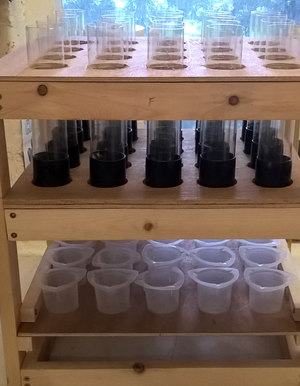 Each soil sample, a depth or column of loam soil, had been previously leached of soil nutrients. Four different granular fertilizers - Polysulphate, ammonium sulphate, sulphate of potash and kieserite - containing equivalent rates of sulphur were added. The soil samples were flushed daily with de-ionised water and the leachate that drained away was measured for sulphate content. The results of the sulphate release experiment show that sulphate in Polysulphate is released gently and over a prolonged period of time, for about 50 days. Sulphur is released where it’s needed in the upper soil level, at the pace the plants need it, and for weeks. Sulphate from other fertilizers is released much more quickly, and probably too quickly for crop roots to be able to capture it and use it over a long period, meaning unused sulphates are leached from the soil. Understanding the nutrients required by crops, and when and how they are available, is an important step in helping farmers to make the right choice of fertilizer to apply in order to achieve the full crop performance. Further details are available in the leaflet Prolonged Nutrient Release Pattern of Polysulphate Fertilizer.